If you’re a regular reader, you might know that I’m the least crafty person ever. As a child/teenager, I loved art, but I was never very good at it. I did pencil sketches of Jordan Knight from New Kids On The Block, I took Higher Art at school (the Scottish equivalent of A Levels), and my dad bought me expensive oil paints for Christmas one year, but I was never as good as I wanted to be. Now that I’m a mum, crafting sessions with my toddler look more like this post by Molly from Mother’s Always Right, rather than mum crafting queen Red Ted Art. But I’m determined to just craft anyway – even if it lasts five minutes at a time and my kitchen ends up covered in glue, sequins and paint – hey, we’re crafting. 1. Create an Easter Sensory Playtable and allow your toddler to explore their creativity. 2. Make a toilet roll Easter Chick. Super easy! 3. Make some Easy Spotty Eggs with food dye and stickers. Loving how these look. 4. Have some messy fun and make Shaving Foam Eggs For An Easter Tree. I am SO doing this with my toddler! 5. A crayon scribbles egg garland is a stupidly easy thing to do for younger kids, and makes the house cheery too, if you have family visiting. 6. These Polka Dot Tulips are great for a toddler who loves to paint! 7. Combine crafting with dressing up – as the Easter bunny! 8. An Easter nest made from spaghetti? Count my daughter in with this one. 9. Possibly the easiest Easter craft ever – Pipe Cleaner Bunny Rabbits. 10. I love an Easter bonnet. Make one from scratch with paper mache. 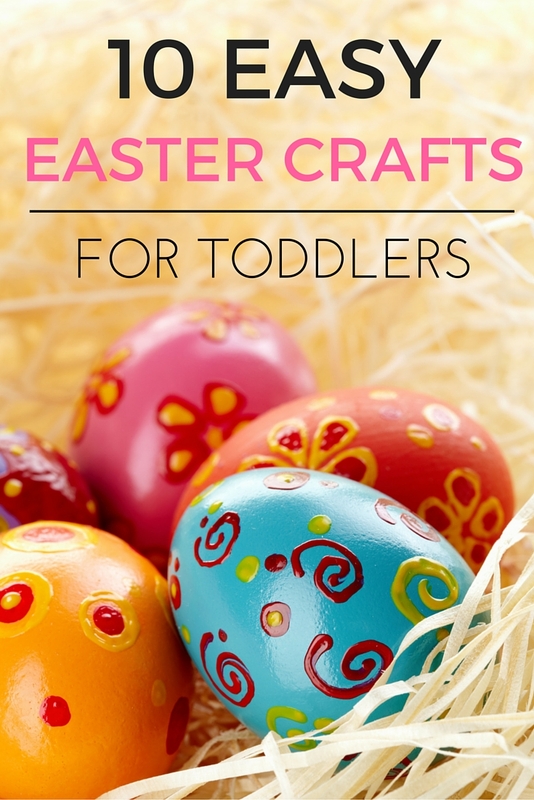 Do you have any Easter crafts you like to make? Leave a link in the comments! Molly – Mother’s Always Right recently posted…What mums really want for Mothering Sunday. Why don’t you check it out? Have you tried any yet, Molly?! Thanks for including my humble garland in your round up! i’ll visit the other sites for more ideas. Thanks again! You have a great round-up of ideas here, some I have never thought trying before. Way to go mum for giving crafting a go with the kids, it can seem so overwhleming at times. Janice recently posted…Valentine’s Day Activities for Kids. Why don’t you check it out? You’re welcome Janice. I am so glad I discovered your blog – it’s got so many fab ideas. I love these and have shared on Facebook, Twitter and Google+ . Makes me wish my boys were small enough to want to do these! Jackie Currie recently posted…St. Patrick’s Day crafts. Why don’t you check it out? You’re welcome Jackie! They are brilliant. Thanks so much for featuring our tulip craft! These are all great ideas and I love your honesty! 5 minutes is plenty of time for being crafty with a toddler anyway 🙂 at least at our house!! Love that you are trying! kristina recently posted…The Great Big Gruffalo Giveaway. Why don’t you check it out? My pleasure Kristina. Thanks for stopping by!